Banded Cat shark not eating - 4/27/04 Hi again my name is Jason, I have a banded cat shark which I hatched from an egg, it lives in a 110 gallon tank which has 3x large canister filters,1x protein skimmer,1x U.V. light system and 1x sand filter. The water test is fine ph above 8.2, nitrate well below 40 ppm etc. <All relative but OK for now> The problem is the shark is now about 6-7 weeks old and up to about 3 days ago was feeding very well on squid, but now it has just stopped, I feed it using a feed stick but it just does not want to know. <???? ?> I have also noticed it is breathing very fast, it also seems to be more active than it used to be. <Well, these sharks have been known to stop eating from time to time. I would recommend to wait for a while. I have heard of these sharks stop eating for weeks on end (3-4 weeks) before beginning to eat again. <Try some other foods, and read through our shark FAQs. Give it time. 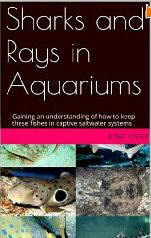 Be sure to feed vitamins (MAZURI) to help supplement the sharks much needed iodine intake and other required vitamins. No silversides!!! Interferes with iodine intake> I hope you can help as I do not wish to loose the shark as it is like a member of the family. <Give it time Jason. Do a 20% water change and continue to try and feed. I would be more concerned if it were over say, three weeks or more likely four. Thanks for the question. ~Paul> Thank you, Jason. Re: Banded cat shark I forgot to ask of all the foods you have used what seems to be a favorite among young banded cat sharks? <Silversides, other whole small fish, cut fish, crustaceans (fresh, frozen/defrosted)... many others... important to not allow to get "used" to limited food choices... and a good idea to soak foods in vitamin and iodide supplement solutions ahead of offering (inserted into foods for larger sharks at all public aquariums)> What type of water quality/parameters are they use too? My tank is a reef tank that has been established for about 3 years. <Please see the WWM site. Bob Fenner> Jeremy Ray Fedoruk B.S.E., C.S.C.S. Horn shark I have a Horn Shark that was eating very well up until 2 days ago . It seems a little sluggish and just has no interest in food .. I feed it squid and shrimp.. any ideas ? >> Probably a little "indigestion". I definitely would not worry. These animals can and do go without feeding for weeks sometimes... Maybe try a bit of fish fillet in a few days.